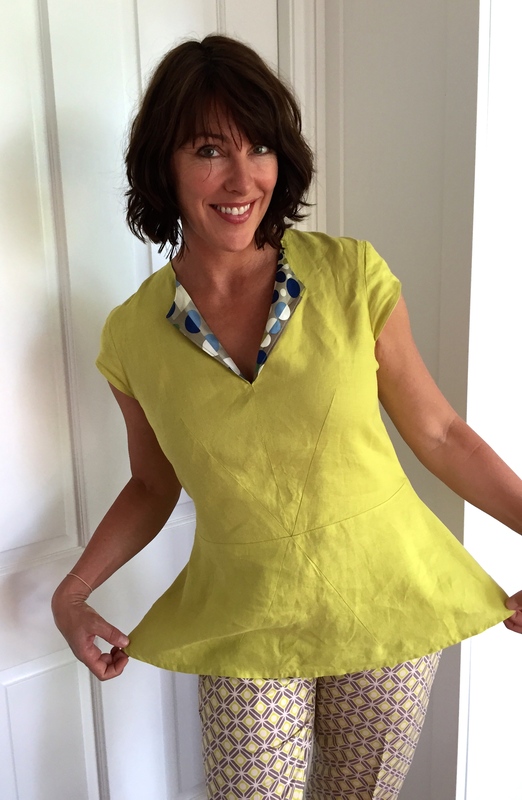 This is the Georgia peplum top from Style Arc patterns. You may recognise its sister from my very first post. Well I have to come clean here, this top actually preceded the dress, it was to be a wearable toile and I was quite chuffed at how beautifully it turned out. Its a comfortable easy going top with a hint of extravaganza in the dart department. Please do check out that dart junction. Bonus – this top covers a post dinner belly quite nicely thank you! 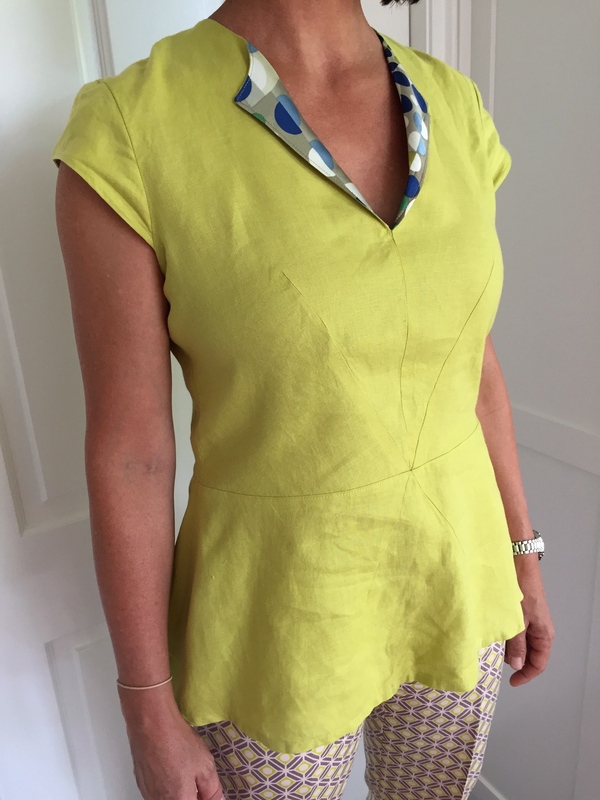 The fabric is a chartreuse linen from…a wonderful anonymous unknown unrecalled donor. You’d think I’d remember someone gifting me a large wad of this lovely linen wouldn’t you – dear donor – thank you again! This top would absolutely rock in a stable knit for a closer fit too – note to self! This is a rare colour to be found in my wardrobe, probably a good thing I suppose. A girl could be known as ‘that crazy chartreuse lady’ – what is she thinking? But along with certain reds, its an accent colour I love! I have green eyes and have been told to wear green by a colour consultant. In all honesty the other colours she told me I should wear seem so wild and dangerous, I can’t go there. 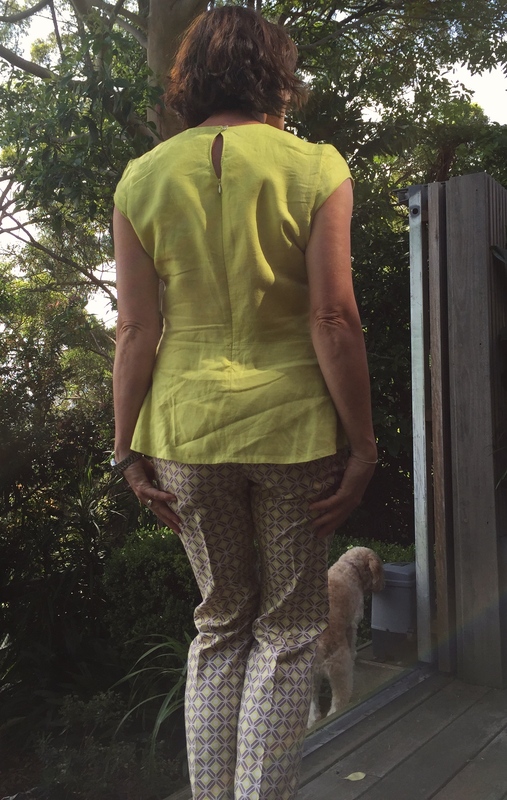 I made Georgia specifically to go with these trousers – a bargain at $50 and they’re silk – made in Italy. I let out the calves to the max. but that was all I altered in these trews. This image popped up in my Feedly today – citron with cognac and olive – courtesy of You Look Fab. Love the look and I thought a bit of experimentation might be in order. You Look Fab is a style blog – a great source of inspiration and definitely worth a look. Angie is a professional at dressing people and the looks she explores aren’t at all formulaic. 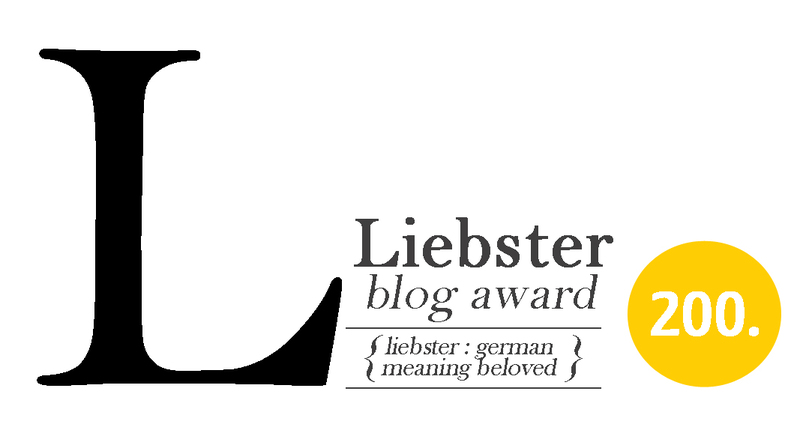 A very welcome change from those blogs with the same gal parading outrageous stuff I just cannot relate to. Alterations to Georgia? High necked tops do have a tendency to accentuate the distance from apex to neck I’m afraid, so I just faced a slit at the front and turned back the ‘collar’. I cut a size 12, my measurements put me in a size 14 – blame the bust! Hey where did I see that lining before? Oh yes, the aforementioned ‘inaugural’ post. The other alteration was a keyhole in the back above a centre back invisible zip. If I made this again, and I totally should, I would take in some excess under the arms and a tuck from the underarm across the back wouldn’t go astray. Also perhaps a forward shoulder adjustment and a little cinch in the waist. I think a sweet little contrast lining on the sleeve and under the peplum might be nice too – watcha think? Oh and the photo below was taken after a meeting, crinkly linen, but at least its not poly and “hey”, someone’s gotta grab my backside! Bye-bye Borrowed Dog, she goes home this week. To make this into a dress, I just dropped the peplum hemline… at least I think thats what I did; but you know my memory cannot be trusted! Failed chic shift – passable uniform! Well the dress didn’t really have a fair chance as the pictures are not very clear, but this is sensational. I love the colour, the detailing (and yes a lined peplum – just great). The darts are beautifully executed. And it looks great with the trousers – quite an exciting colour combination I would say. Oh yes, first post novice! I’ve fixed those pics now. Thanks for the alert! Love the darts. Love the look of all the seams coming together. Love the keyhole(?) in the back. Love the bright color. It looks very good on you! Much appreciated, thanks for dropping by. This is certainly a talented pattern, so tweak-able! Hey, nice to meet you! I bow to your dart junction! And what great colours. I too have a weakness for lime/kiwi (ok, chartreuse..) My son and daughter, though younger than yours, are also 4 years (- a month) in difference. Let me know how it’ll go as they teenage together! Thanks so much for following. Yes, I was a bit pleased with that dart junction! My kids are both darlings especially as my daughter goes to boarding school in another state! Actually, I see you’re British, Prince Charles went to my daughter’s school! Our kids get on really well together, they’ve always doted on each other. Now they don’t even get the chance to argue! I LOVE this top! And your darts are spectacular! You will have to show me what trick you use to make sure they all junction in the right spot.